By Hong Soon-do, Beijing correspondent, AsiaToday - It has been revealed that nearly sixty Chinese Christians have recently applied for political asylum in the Czech Republic due to China's religious persecution. If this is the case, it would be a big blow to China who already faces criticism from Western countries including the United States over its human right issues. According to Western sources in Beijing on Monday, such asylum applications by Chinese in the United States or Europe is not a world-shaking event. But it's definitely not a common thing if such application is filed by a group of more than 60 people. It is unprecedented in the history of this country. Moreover, things will worsen if those Chinese are real Christians. This could mean that China's religious and human right problems are worse than we could have ever imagined. It could also mean that they are responding more aggressively than ever before. Nevertheless, the Chinese government did not bother to hide the event. The government blazed the news widely through the August 8th report of the Global Times, a sister publication in the People's Daily. This response seems quite unusual. However, the newspaper did not forget to cast doubts on what the case is really about. It considers the 60 Chinese in the Czech Republic as illegal immigrants disguised themselves as Christians. Perhaps, this is why the government has sent officials from the Chinese Embassy in Prague to grasp the situation. For now, it's not certain whether the sixty Chinese are Christians or illegal immigrants as what the Chinese government say. But the problem is whether the Czech Republic will accept them or not if they are found to be real Christians. Under international law, the Czech Republic has no choice but to accept them. However, its current relationship with China is pretty good that Czech President Milos Zeman has visited China twice in the last two years. If the Christians are granted asylum, the relationship between the two countries will be rather awkward. Moreover, China will be put on a quite annoying situation. No matter the outcome, at least one thing is clear. 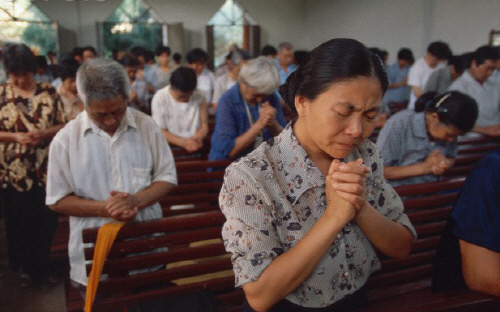 China is not guaranteeing complete freedom of religion of more than one million Christians in China.